Woke up in Esquel after my first true night’s sleep, with the window cracked and cool morning air blowing in off the roof. I methodically repacked my things and met Ulf upstairs for breakfast in a large open room, that likely used to be a ballroom. The red curtains were pulled back from the windows like hair tucked behind a woman’s ear, and refreshing morning sunlight flooded the room. Breakfast was as meager as the day before: breads and jams, cold cut ham and turkey, slices of cheese, yogurt, and cereal. I laid out my maps on the table in front of me, trying not to spill anything on the white tablecloth. Ulf sat down in front of me with a big cup of coffee. “Careful with the coffee,” he said as he settled into his seat, “The handle is for a garden hose or something, it is very hot”. Outside on the sidewalk, we loaded our bikes back down. I realised I had packed too much. My thoughts were that I could overpack my ruck because, unlike previous trips I’d made, I wouldn’t be lugging it around from Plane to Train to Cab and walking miles upon miles with it. It would just be from bike to hotel to bike. But I’d taken that thought too far and I could tell when I took hard turns that the weight differential of the motorcycle was seriously off. Besides my hulking rucksack, I now had to figure out what to do with everything that was packed into the left plastic sidebag, and the tank bag, both of which I’d broken in the spill. We’d tried, and failed, to reattach the bags; there was no use. I wound up strapping the olive green duffel bag my grandpa had given me straight to the luggage frame. I ditched the busted luggage there on the sidewalk. There was a sign there in front of the hotel pointing North and South. To the south it read 1,937 Kilometers to Ushuaia, Argentina and to the north it read 16.363 Kilometers to Anchorage, Alaska. I thought about sea kayaking last spring with the otters in Homer, Alaska and just how crazy it was that now I was in Argentina, hopped up on coffee, about to head forever south. We hit the pavement hard, quickly cruising at 75 mph with a prevalent tail wind. 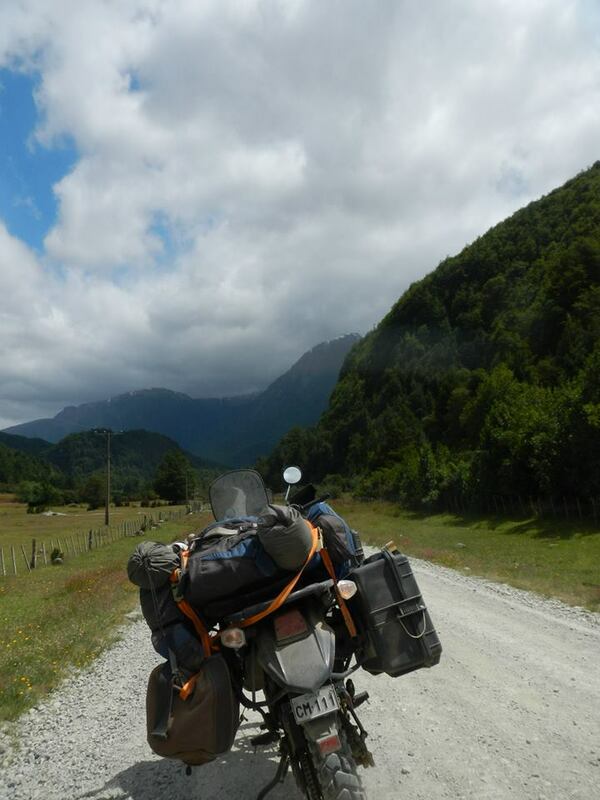 The 650, all loaded down with my gear, was just about at its top end, the engine whining loud, but smoothly. The pavement didn’t last long. After Trevelin, it was back to gravel, and from the look of the map, it would be more of the same the rest of the day. As we neared the border, to cross back into Chile, the wind came howling across the valley, slowing us down to about 20-25 mph at the most. The dust was kicked up so high in the air it blocked the sun, and the wind hit us so hard that it was pulling my helmet off my head, the chin strap choking me intermittently. The wind would die down for a moment, letting the dust settle, and then come again with a gust that threatened to knock us off our bikes. One gust was so strong it pulled the visor completely off my helmet, a second gust came and pulled my face shield out of the bindings. That’s what I get for buying a cheap moto-x helmet. But it had looked so cool. 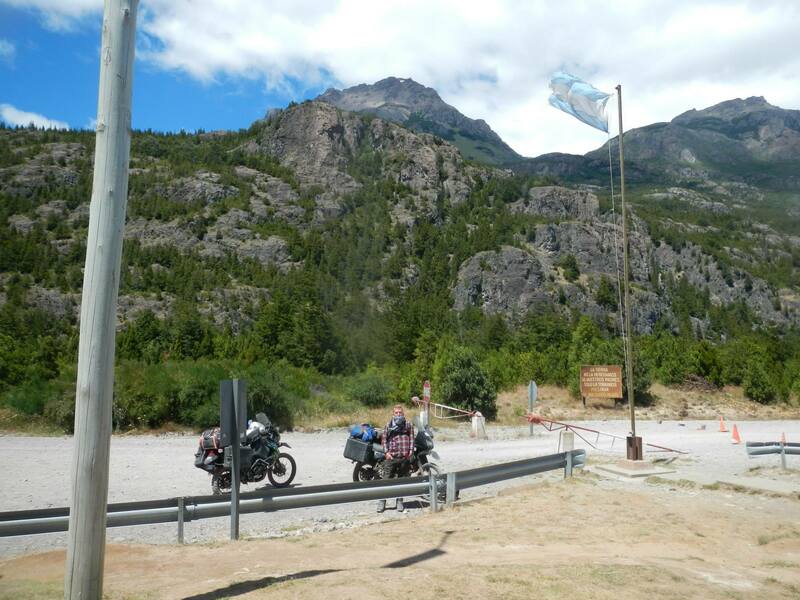 We pulled into the Aduana building, a wooden cabin in the middle of nowhere, and dismounted our bikes in the wind, a threadbare Argentinian flag whipping high above our heads. I pulled my helmet off and looked down. My clothes were completely covered in dust. I pulled off my gloves and noticed that my hands were beet red. I shrugged it off and walked inside. From the customs line, I looked out the window at our bikes, cloaked by the dust storm. Ulf’s bike was suddenly on the ground, all 500 pounds of it blown over in the wind. The rest of the day I was fighting with my helmet. The binding for the left side of the face shield was now completely gone, and wind was coming up through the bottom popping the shield out of what was left of the bolt into the helmet. Thankfully, after we entered Chile, we had some mountains around us blocking the wind. We also immediately hit a narrow two lane paved road that snaked through a river canyon, bobbing up and down hills, around smooth but sharp turns. 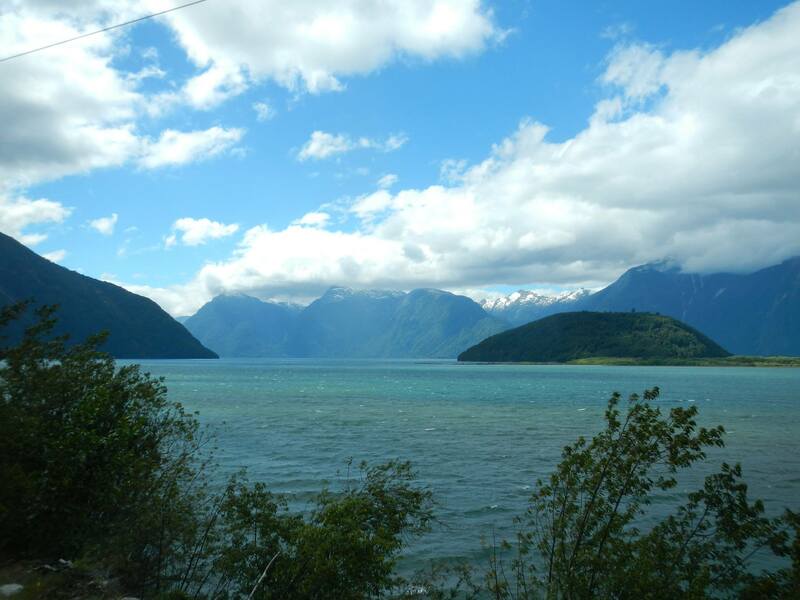 For the first time the scenery took a back seat to the riding, which was perfect, for about ten kilometers. 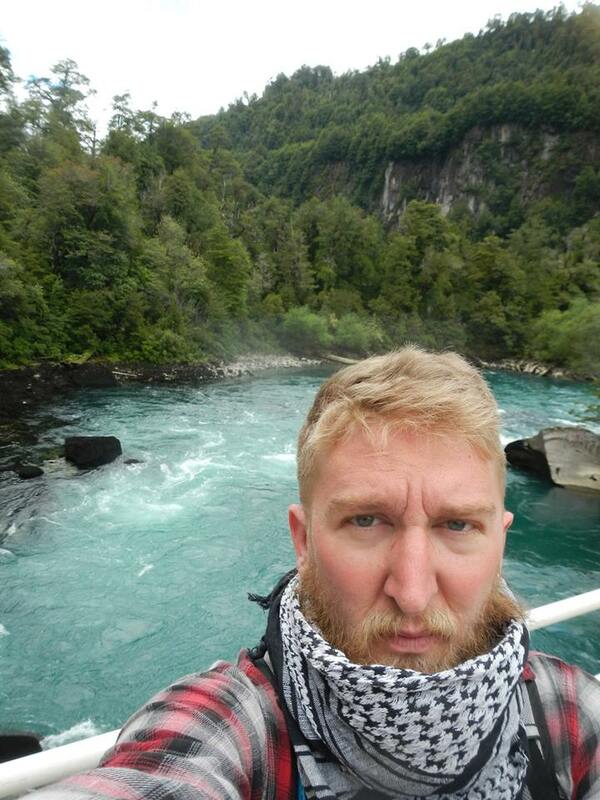 We stopped at a bridge in the Futafelu canyon and listened to the rapids rush loudly beneath us. The canyon rose high above, striations in the rock revealing a violent geologic past. I pointed out how the trees were growing off the side of vertical canyon walls, looking like moss clinging to a rock. “It is the struggle of nature,” said Ulf stoicly. After a much needed breather on the bridge, it was back to god damned gravel. 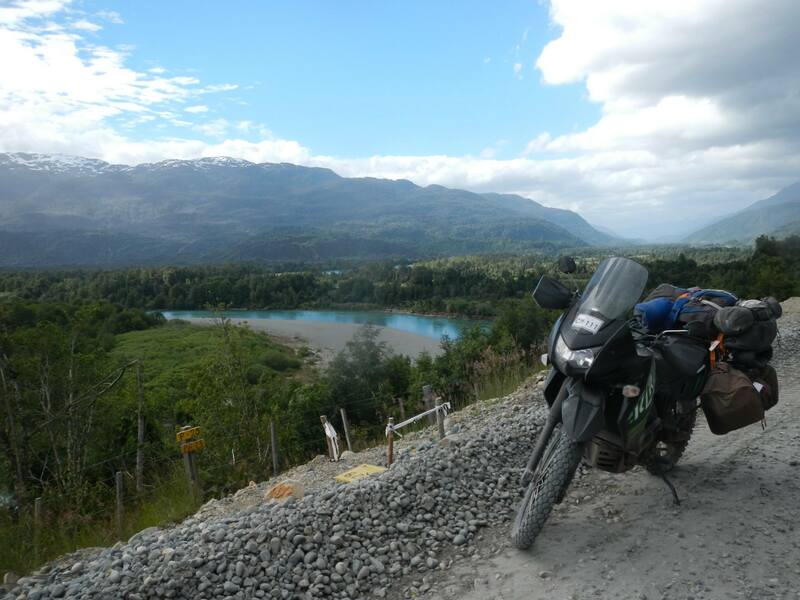 The gravel conditions vary widely on the route to the bottom of the world. I can’t find a rhyme or reason for why solid packed gravel suddenly gives way to loose murderous rock. You learn to judge the conditions of the gravel, and therefore your appropriate speed, by color and, to some extent, texture. For it to make any difference, and keep you rubber down, you have to be constantly looking ahead 12 to 15 seconds just to make sure your clay/gravel solid ground isn’t going to turn to a pile of river rocks and force you down. According to the billboards put up by the Ministerio del Interior, Chile is undertaking a massive public works campaign to pave all of their main roads, so I apologise for cursing them so much. As we neared our destination, I took advantage of a few kilometers of solid gravel, to think about the scenic grandeur of Patagonia. It was like all of the beauty from every place I’d ever been– Switzerland, Alaska, Ireland, California– dropped under the same southern sky, and here I was completely immersed in it. I watched Ulf in front of me, dipping down with the gravelly road, stop to chat with a cyclist. We’ve seen quite a few of these guys on the route. Ulf calls them the “real heroes”. They always look exhausted, like zombies pedaling with blank expressions, eyes fixed on the horizon. I feel bad for them when I pass at 50 miles an hour, dusting them as I penetrate their panoramic view. I stopped in La Junta, named after the famous Chilean coup d’etat of ’73, and waited for Ulf to catch up. The scenery had gone from the wide open golden plains of Trevelin to the tapering Futafelu canyon, and now to the green foggy mountains of La Junta. The road coming into town was so bad it was almost impassable. I keep thinking about access roads to well heads out in West Texas, and how the big semis left pot holes and craters and how miserable they were in a truck and how now I’m on a motorcycle dealing with worse, and how when the wind picks up I just have to sing something in my helmet and white knuckle the grips and hope I don’t take a spill.